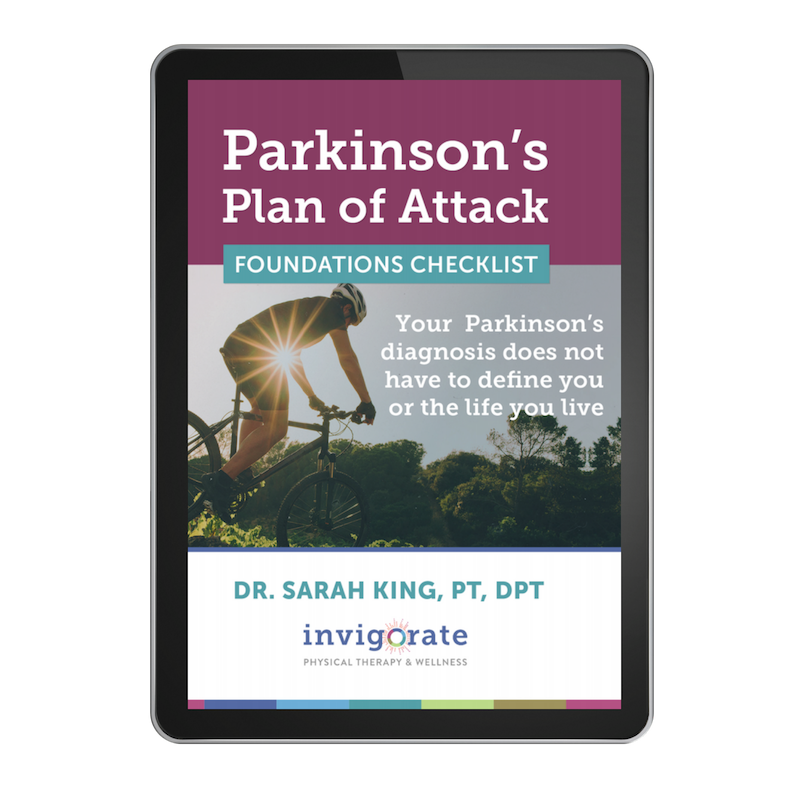 If your life partner gets diagnosed with Parkinson’s, you’re in for the ride, and if you don’t learn how to best face this diagnosis head-on together, your days and years moving forward will be much more challenging than they need to be. Today we’re covering the 8 things you need to know if you’re spouse or close partner has been diagnosed with Parkinson’s disease. These 8 lessons come from Nancy Hovey, a wonderful woman who’s husband, Steve, was diagnosed over 10 years ago with Parkinson’s disease at age 50. Over the years they’ve both learned many lessons about how to live well with Parkinson’s in their life. Feeling whole and healthy in order to be a helpful caregiver means taking care of mind, body, and soul. Feeling emotionally well, fulfilled in life, doing things that are physically active, remaining social and connected to loved ones, and leaning strongly on faith are all things that help me to be strong. And you’ve just got to stay strong. We already did those things, so there was a natural adjustment period. When you go through those first early stages of diagnosis, take time to adjust. You don’t have to jump into anything or hurry to join a support group. Let the diagnosis sink in and things will come around, a day at a time. Trying to read or try too many things can be overwhelming, so don’t try to put too much stress or pressure on yourself. You will feel better, you will come around, and you will find your stride. There are many resources out there; some are good and some are not as good. It’s important to find the resources that are helpful to you and to know that what you’re reading is the right thing for your situation. Davis Phinney Foundation and Michael J. Fox Foundation are both great, as is going to conferences, being in discussions, and being in support groups. Other people have new things to give you and they can help you stay on top of the research in the world of Parkinson’s. The support you gain from meeting other people who are experiencing the same is amazing. These are the people who know what you’re talking about and who get it; they are living the same life that you are so they understand things in a way that others do not. Family and friends are solid ground, but connection to the Parkinson’s community is critical and empowers you to see that you are not facing things on your own. Not every support group is right, and your family and friends may not be available to you the way that you need them to be. Don’t be afraid to seek out a lot of different resources. You might need to try a few first. Don’t be afraid to manage changes as you go along. Things will be less stressful if you don’t feel stuck or trapped where you are. Move closer to family, if you need to, or make adjustments in your daily schedule. Talk about them with your partner and if a change is going to make your quality of life better, do it! Parkinson’s is progressive, but you can make your adjustments as you go along to make your life as enjoyable as possible. In any relationship, but a partnership especially, communication is so important. We are open with our emotions, and because we deal with a lot of unknowns communication is critical for both of us. Being able to take a minute and say “Let’s reset” when things aren’t going well is a really good idea. Making time for each other to come together is important. Take time to be alone and not be surrounded by chaos to stay connected and bonded. Maintain your sense of humor, whether you have one or not! Things happen with Parkinson’s that might not be so much fun, but if you can keep your sense of humor and laugh, it feels good. There are so many awesome things that will continue to happen in life! It’s easy to get frustrated and down about the things that are tough, but there are so many things to take delight in. Be conscious about the things that you are doing that you enjoy so you can say “This is really great; we can be happy about this.” Celebrate the victories, because there will be more than you realize. Once you feel healthy enough to help others, it is so healing and satisfying to be able to reach out to other people. It doesn’t mean necessarily being a counselor; you could lead a support group or participate in a study. Meeting other caregivers is really rewarding, too, and so is advocacy for nonprofits. Nancy and her husband are both passionately involved with the Parkinson’s non-profit, the Davis Phinney Foundation as well as being advocates for living well and public policies to support those affected by Parkinson’s.